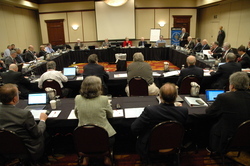 The ARRL Board of Directors will hold its second meeting of 2015 Friday and Saturday, July 17-18, in Windsor, Connecticut. Much of the League's governance work is done by committees between Board meetings. At this meeting, as usual, the Board will receive reports and consider recommendations from its committees. Among these, the Board will hear the recommendations of the HF Band Planning Committee, based on more than 1000 responses to a web survey and additional comments from members earlier this year. The ARRL had asked members to give their opinions on possible changes to the League's HF Band Plans suggested by the committee. The survey was part of the committee's efforts to tweak the band plans for the RTTY/data/CW portions of 80 through 10 meters -- excepting 60 meters. The committee developed its suggested revisions to the voluntary band plans after reviewing some 400 member comments solicited last year, seeking suggestions for using the spectrum more efficiently so that data modes may coexist compatibly. In addition, the Board's Strategic Planning Working Group will present an interim report as it develops a strategic plan to propose for adoption next year. The Board will also consider a proposal for a 2016 ARRL National Convention. IARU President Tim Ellam, VE6SH/G4HUA, and Radio Amateurs of Canada President Geoff Bawden, VE4BAW, are expected to attend the July meeting as guests of the Board. 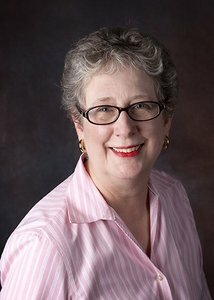 ARRL President Kay Craigie, N3KN, said in the July ARRL Legislative Update Newsletter that Washington politicians are paying attention to League members who have contacted lawmakers to urge their cosponsorship of the Amateur Radio Parity Act of 2015. Essentially identical bills have been introduced in both the US House (H.R. 1301) and Senate (S. 1685). Both measures would direct the FCC to extend its rules relating to reasonable accommodation of Amateur Service communications to private land-use restrictions. "Many visits have been made to the offices of Senators and Congressmen on behalf of H.R. 1301 and S. 1685 by members of the ARRL Board and ARRL Headquarters staff," President Craigie said. 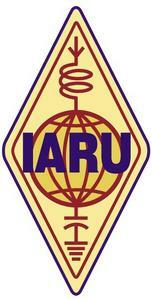 "ARRL Section Managers have encouraged members to speak out. ARRL members around the country have talked with your elected officials in their home-district offices and town hall meetings. This is a full-team advocacy effort." To date, H.R. 1301 has attracted 86 cosponsors; the just-introduced Senate bill, S. 1685, has one original cosponsor. President Craigie said The Amateur Radio Parity Act of 2015 is aimed at helping to ensure the future of Amateur Radio, as more and more neighborhoods impose deed restrictions that prohibit Amateur Radio antennas and keep today's youngsters from becoming active radio amateurs. "What if their parents have bought houses in neighborhoods with deed restrictions prohibiting antennas?" she speculated. "Those kids' interest in ham radio gained from school, Scouts, or family friends will have no way to blossom into the life-changing experience of being radio amateurs." ARRL members, she continued, "are working together so that both today's amateurs and the kids who will be amateurs in the future have the chance to operate from their homes." Letters from members urging support of the bills are what make the difference between being ignored and being heard on Capitol Hill. "Earlier this year, I visited a North Carolina Congressman's office and got a friendly reception -- but no cosponsorship," President Craigie recounted. "More recently, another ARRL person followed up at the same office, with the same staff member, but with about 40 letters in hand. The Congressman became a cosponsor." The newsletter suggested several ways ARRL members can get involved in the Amateur Radio Parity Act grassroots effort. One idea is to have a "letter party" at your next club meeting. Take pre-addressed copies of letters to all three of your lawmakers -- one in the House, two in the Senate -- and have club members add their names, addresses, and signatures to letters for each Member of Congress. Have enough copies, so that each individual can sign his or her own letter. In some cases, club members in a given area may reside in more than one Congressional district. Names and addresses of US House and Senate members are available on the ARRL website. Mail the collected letters to the ARRL (c/o The Amateur Radio Parity Act, ARRL, 225 Main St, Newington, CT 06111), which will collate them for hand delivery on Capitol Hill. Members also may e-mail their lawmakers, post comments on their US House or Senate member's website, or call their lawmakers on the telephone. Be courteous, make your points, and be brief. In all cases, thank lawmakers for considering your point of view. "Grassroots politics is about you -- the individual -- making your voice heard," the July Legislative Update pointed out. "It requires a good deal of preparation and effort to achieve the end results." The League now has a combined web page to accommodate activities on behalf of both the House and Senate bills. The Amateur Radio Parity Act of 2015 is H.R. 1301 in the US House of Representatives and S. 1685 in the US Senate. The Amateur Radio Parity Act of 2015 page provides a clearing house for all information on these identical pieces of legislation. International Amateur Radio Union (IARU) member-societies are taking a second vote on whether to admit Kosovo's national Amateur Radio association, Shoqata e Radio Amatoreve te Kosoves (SHRAK) to IARU membership. "Many of you will recall that Kosovo was proposed for IARU membership in IARU Proposal 251 in 2014," IARU Secretary Rod Stafford, W6ROD, explained in an e-mail to members. "Fifty-one affirmative votes were required for approval; 49 affirmative votes were received prior to the close of voting, so the proposal failed." Stafford pointed out, however, that two more affirmative votes arrived "very shortly after the close of voting" but could not be counted under IARU rules. "Under the circumstances, IARU Region 1 requested the International Secretariat conduct a revote for the admission of Kosovo," Stafford said. He urged member-societies to return their ballots as soon as possible. Amateur Radio was revived in Kosovo in 2012, and a training and licensing program has been established there. The Amateur Radio on the International Space Station (ARISS) program has kicked off a fundraising program, and it's offering an ARISS Challenge Coin as a token of appreciation to those who contribute at a certain level. ARISS relies on resource support from NASA, ARRL, AMSAT, and individual donors and volunteers to ensure day-to-day operation of its programs and to pay for spaceflight equipment certification. In light of budget cutbacks at NASA over the past 2 years, the funding needed to cover operational expenses down the road has become more uncertain, however, and ARISS leadership initiated the fundraising effort with the goal of securing greater financial stability. 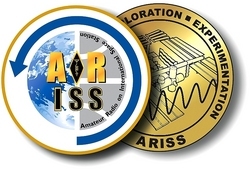 An artist's rendering of the obverse and reverse sides of the ARISS Challenge Coin. "To assure the future of the program, we are looking to individuals and corporate sponsors to provide the resources we will need to sustain operations and to acquire needed equipment upgrades," said ARISS International Chair Frank Bauer, KA3HDO. Plans are under way to develop a new, higher-power Amateur Radio station for the ISS Columbus module. The current radio is a lower-power unit that sometimes results in weak signals during ISS-to-Earth educational contacts. A new radio system will improve communication capability for students scheduled to participate in ARISS educational contacts and related activities. The new system also would allow greater interoperability between the Columbus module and the Russian Service Module. ARISS said that integration of the equipment into the ISS infrastructure and the necessary testing and certification require hours of engineering resources that it cannot afford. "Each ARISS contact offers the opportunity to inspire young people through ARISS's unique window into space exploration activities, opening the horizon of possibilities of a career in a STEM field," said ARRL Education Services Manager, Debra Johnson, K1DMJ. "Each contact also introduces students and their communities to Amateur Radio. The program needs your help to secure these opportunities for the future." To commemorate the 40th anniversary of the Apollo-Soyuz mission, the Amateur Radio on the International Space Station (ARISS) team will transmit a series of 12 Slow Scan Television (SSTV) images. The SSTV transmissions 145.80 MHz will begin on the morning of Saturday, July 18, and continue through Sunday July 19, subject to change. Apollo-Soyuz represented the first joint US-USSR mission, and it set the stage for later US-Russia collaboration on the space shuttle, Mir Space Station, and the International Space Station. 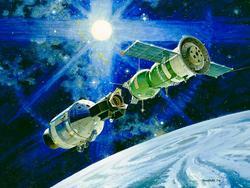 A NASA artist's rendering of the Apollo-Soyuz linkup in 1975. "The Apollo-Soyuz Test Project would send NASA astronauts Tom Stafford, Deke Slayton, and Vance Brand in an Apollo Command and Service Module to meet Russian cosmonauts Aleksey Leonov and Valeriy Kubasov in a Soyuz capsule," NASA has recounted. "A jointly designed, US-built docking module fulfilled the main technical goal of the mission, demonstrating that two dissimilar craft could dock in orbit. But the human side of the mission went far beyond that." The Soyuz and Apollo vehicles were docked from July 17-19, 1975. During that time, the three astronauts and two cosmonauts carried out experiments and other activities. Apollo-Soyuz was the final mission of the Apollo program and the last US human spaceflight mission prior to the inaugural space shuttle mission in 1981. Submit SSTV images to the ARISS SSTV image gallery, which will post the best SSTV images received from this event. The ISS cosmonauts will take time out from the SSTV transmissions on July 18 to conduct an ARISS contact (starting at approximately 1655 UTC) with students attending the Moon Day/Frontiers of Flight Museum event in Dallas, Texas. Streaming audio will be available. 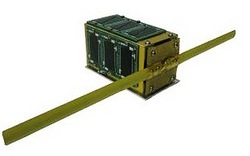 At just a few months shy of turning 2 years old, the $50SAT Amateur Radio "PocketQube" microsatellite -- also known as Eagle 2 (MO-76) -- is still operating, although it's not entirely well either. The satellite, which transmits on 437.505 MHz at a power of 100 mW, may be heard using a handheld transceiver, but it does not include a transponder. Launched in late 2013 from Russia, $50SAT is a collaborative education project of Prof Bob Twiggs, KE6QMD, of Kentucky's Morehead State University, and three other radio amateurs -- Howie DeFelice, AB2S; Michael Kirkhart, KD8QBA, and Stuart Robinson, GW7HPW. Formerly of Stanford University, Twiggs and Jordi Puig-Suari of Cal Poly are the co-inventors of the CubeSat model. $50SAT's stated purpose was to evaluate if the PocketQube form factor offered a cost-effective means for engineering and science students to use in developing real-world skills. The "$50" is a bit of a misnomer. The tiny satellite actually was constructed from about $250 worth of parts. Kirkhart recently offered an update on $50SAT, which measures just 5 × 5 × 7.5 cm and weights 210 grams. "The good news is [that] it is still operating. The bad news is the power situation has been degrading, with an apparent step change on or near May 12, 2015, followed by another on June 23, 2015," he recently posted. Kirkhart, who lives in Michigan, said his last full telemetry capture was on May 27, and the last time he heard $50SAT was on June 6. "I continued to attempt to listen for it for another week or so, and heard nothing," he said. $50SAT transmissions repeat about every 75 seconds, starting with an FM slow Morse code call sign beacon, data at 60 WPM Morse, and FSK RTTY data and digital data telemetry. Since then, Kirkhart has been monitoring the satellite via the WebSDR site of Anton Janovsky, ZR6AIC, as $50SAT makes daytime passes over South Africa. "During these passes, where it has already spent a significant amount of time in sunlight, the battery voltage is below 3400 mV," he said. Kirkhart speculated that while loss of battery capacity is likely, "it appears the low battery voltage is due to low solar power output." He said this could be a result of solar cell damage; since there was no protective covering on the solar cells, the impact of high-energy particles could have damaged the solar cells, resulting in a drop in output. He also said the solar cells could have been damaged through thermal cycling. A short circuit is another possibility, but, Kirkhart said that, because of the limited amount of telemetry gathered, "it may not be possible to determine the exact cause." He said that if the solar output continues to drop, the battery voltage may never get above the 3300 mV threshold needed to enable the transmitter, "at which point we will lose the ability to monitor its status." If you worked VY1AAA in Yukon Territory (Northern Territories or NT Section) during Field Day 2015 or Canada Day, the operator was actually in the US. VY1AAA is a Canadian club station call sign for the station of J Allen, VY1JA, near Whitehorse, Yukon Territory. Gerry Hull, W1VE, was among those operating VY1AAA remotely from the K1B Field Day site of the Contoocook Valley Radio Club (CVRC) in New Hampshire. The operation was part of a project to provide remote control capability for VY1JA, and Hull said the point of the VY1AAA call sign was not to burden Allen with QSL chores. He said he's been using Logbook of The World (LoTW) but will have some QSL cards printed too. He added that he's already received "a ton" of QSL requests as a result of the Field Day and Canada Day operations. "We are up and running with the Ten-Tec Omni VII," Hull told ARRL. "The antennas are still something in the works. He currently has two ground planes mounted on power poles. We use the 40 meter antenna on 40, 15, and 10 and the 80 meter vertical on 20 via a high-power tuner. This gives us 80-10 meter coverage." The project is looking into additional equipment. Hull, who worked at ARRL HQ as a technical editor in the early 1980s under Doug DeMaw, W1FB (SK), said Allen hopes to install a new antenna -- possibly a V beam or a rhombic -- using recycled utility poles for supports. "J also has a 105 foot tower and a quad to get back up," he added. Allen, who has worked for an electric utility for years, will be retiring and will have more time for station development, Hull said. Meanwhile, Andy McLellan, VE9DX, has been working on getting WSJT, PSK31, and RTTY modes up and running. Hull said he doesn't think there's been much digital mode activity from Yukon Territory for some time now. "We are working out kinks, but, so far, so good," Hull concluded. A video of the CVRC Field Day operation includes some VY1AAA contacts. Read more. 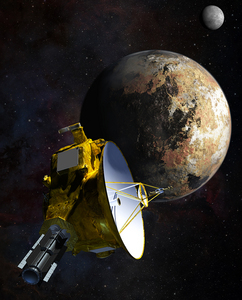 NASA's New Horizons spacecraft made its historic rendezvous with Pluto this week. While there is no direct Amateur Radio involvement in the Pluto flyby, many amateurs are curious about how NASA communicates with New Horizons at a distance of nearly 3 billion miles. At that vast distance, New Horzions' radio signal is extremely weak -- so weak that only the Deep Space Network's largest 70 meter parabolic dish antennas and receivers are capable of detecting it. New Horizons downlink transmissions take place on an X-Band frequency of approximately 8.4 GHz (the uplink is 7.2 GHz). In terms of raw RF output, the traveling wave tube amplifiers (TWTAs) aboard the spacecraft supply only 12 W to its 2.1-meter high-gain antenna. There are two TWTAs aboard New Horizons. Each is connected to a separate radiating element at the antenna. One element is configured for left-hand circular polarization and the other for right-hand circular polarization. The original intent for using two TWTA was for redundancy. As the spacecraft was on its way to Pluto, however, engineers discovered that they could use this cross-polarized configuration to transmit two signals simultaneously. At the Deep Space Network they designed a system to detect the separately polarized signals and combine them for substantially greater gain. A stronger signal means New Horizons can transmit at a higher data rate -- about 1.9 times the rate than with a single TWTA. Unfortunately, New Horizon's nuclear-powered generator has decayed during its 10-year flight, and there is no longer enough power to run two TWTAs at the same time, unless the team shuts down another onboard system. This is why it will take considerable time to download the treasure trove of images and other information that New Horizons carries in its memory. At present, New Horizons is transmitting data at just 1 kilobit per second. A typical image produced by LORRI, the Long Range Reconnaissance Imager, is about 2.5 Megabits, even when compressed. At such a low transmitting data rate, it takes about 42 minutes for New Horizons to transmit a single image to Earth -- and then there is the 4.5-hour trip at the speed of light! This is why mission scientists are warning an impatient public that it will be well into 2016 before all of the data arrives at Earth. A footnote: In 2005, NASA invited individuals to sign on to the "first mission to the last planet." Their names -- and sometimes Amateur Radio call signs -- burned onto a compact disc went into deep space on the New Horizons spacecraft. Participants, such as ARRL member Angel Santana, WP3GW, received a certificate of appreciation from NASA. He wondered how many other hams were among the more than 430,000 who took NASA up on its invitation to, "Come with us as we complete the reconnaissance of the solar system and unlock the secrets of Pluto, its moon Charon, and the Kuiper Belt." DeorbitSail CubeSat Put into Orbit, Heard in US: The DeorbitSail CubeSat, built by researchers and radio amateurs at the Surrey Space Centre in Guildford, England, was launched into orbit on July 10. It carries a 1200 bps BPSK beacon transmitting on 145.975 MHz. The first DeorbitSail packet reports to the Surrey Space Centre came from Ken Swaggart, W7KKE, in Oregon. Nitin Muttin, VU3TYG, reported receiving signals as the CubeSat passed over India. 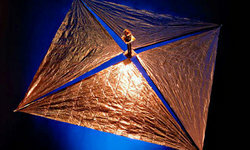 The DeorbitSail project is a collaboration to build a 3U CubeSat with a deployable sail that will demonstrate rapid deorbiting from low-Earth orbit, taking advantage of the increased aerodynamic drag from a large deployed sail. The satellite will return to the Earth and burn up in the atmosphere over time, as its altitude reduces. The project has expressed its gratitude to the European Commission Seventh Framework Programme (FP7). Chris Bridges, 2E0OBC, is accepting all available telemetry files via e-mail. Tracking and other information is available on the AMSAT-UK website. Follow the Surrey Space Center on Twitter. Chris Cassidy, KF5KDR Named to Head NASA Astronaut Office: Ham-Astronaut Chris Cassidy, KF5KDR, has been appointed chief of NASA's Astronaut Office. Cassidy, who conducted several Amateur Radio on the International Space Station (ARISS) contacts as part of the Expedition 35/36 crew onboard the ISS in 2013, is a US Navy Captain and a former Navy SEAL. NASA officials announced his appointment on July 9. 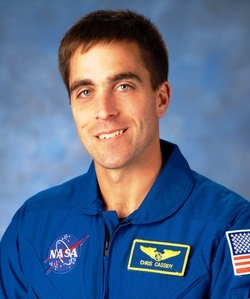 During his career as an astronaut, Cassidy, 45, spent 182 days in space and carried out six spacewalks. In addition to time on the ISS, Cassidy was part of a Shuttle Endeavour crew. He replaces US Air Force Col Robert Behnken, KE5GGX. In his new role, Cassidy will manage the operations and safety programs of NASA's Astronaut Office. He'll also help to develop astronaut flight crew operational concepts as well as crew assignments for future space missions. Two Radio Amateurs Set to Launch to ISS: Three new International Space Station (ISS) crew members will launch July 23 (UTC) from Baikonur Cosmodrome in Kazakhstan. 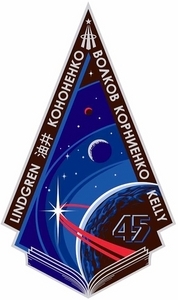 Kjell Lindgren, KO5MOS; Oleg Kononenko, RN3DX, and Kimiya Yui will travel into space in a Russian Soyuz spacecraft that will rendezvous with the ISS and dock after four orbits of Earth. NASA TV will cover the activities. Expedition 44 Commander Gennady Padalka, RN3DT, and Flight Engineers Scott Kelly and Mikhail Kornienko, RN3BF, will be on hand to greet the newcomers. Lindgren, Kononenko, and Yui will remain on station until late December. Kelly and Kornienko, who have been onboard the ISS since March, will return to Earth next March at the end of their 1-year mission. Padalka, who also has been aboard since March, will return to Earth in September. Tad Cook, K7RA, Seattle, reports: Average daily sunspot numbers dropped from 109.1 on July 2-8 to 73.7 in the past week, July 9-15. Average daily solar flux dropped from 123.2 to 114.8 over the same two periods. Geomagnetic indices were more active, with average daily planetary A index increasing from 10 to 13.7, and average mid-latitude A index going from 8.9 to 12.3. The geomagnetic field was active on July 11 when the mid-latitude A index, the high latitude college A index, and planetary A index were 20, 44 and 23. Activity was greater on July 13, when the three indices were 22, 45, and 32. The July 11 activity was the result of a G1 class geomagnetic storm caused by a high-speed solar wind stream; similar events caused the July 13 activity. There is very little chance at present of solar flares or geomagnetic storms over the next few days. Predicted planetary A index is 5 on July 16-30; 18 on July 31; 25 on August 1, and 12 on August 2. On August 3-5 the planetary A index is predicted at 5; then 20 and 25 on August 6-7, and 8 on August 8-10. For August 11 and beyond, the planetary A index prediction is 5. Predicted solar flux is 100 on July 16-18; 105 on July 19-20; 100 on July 21-22; 105 on July 23; 110 on July 24-25; 115 on July 26; 120 on July 27-31, and 115 on August 1-4. Solar flux is expected to rise to 120 again after August 22. Recently there have been only a few new sunspot groups -- one each on July 7, 8, 10, and 12. 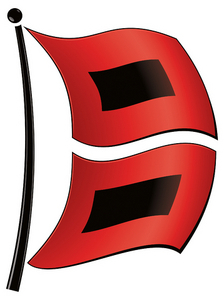 In Friday's bulletin look for reports from readers and updated forecasts. Send me your reports and observations.